ssLASER - Laser Cutting and Engraving Package. The ssLASER application utilizes the ss4544 4 axes motion control system, along with either the NETPAN or PANP for a control panel, and the ssLASER.drv windows driver. This package allows you to literally print your laser control from Windows95/98 applications in mixed vector, raster and 8bit greyscale formats. You can also do rubber stamps. For example, using Corel Draw you could create a drawing of a widget to be cut out of a plastic sheet with your logo and phone number. The logo would be coded by a color to indicate to the driver the properties to use when rastering with the laser. The cutting outline would be coded by setting a minimum line width and a color to indicate to the driver that line should be cut and at what speed and power. Printing the drawing to the ssLASER would cause the object to be fabricated on you machine. ssLASER.drv - Windows Printer Driver for directly controlling the ss4544M motion control system. This is used in conjunction with the ssLASER software running in the ss4544 box. The driver allows you to create an image and/or cutting pattern in your favorite drawing program, such as Corel draw. Using colors in your drawing you can code different lines or raster images to be cut with the laser at controlled depths using different power, speed, and pulse density settings for each color in the drawing. The driver supports the control of Gas assist and a user defined auxiliary function associated with each of the eight drawing colors. You can also automatically turn on and off your exhaust venting system. The driver also supports a rotary fixture, automatically wrapping the drawing around an object with a specified diameter. Drawings may be done in either the English or Metric system. Driver settings may be saved in setup files, to conveniently recall for particular job types. ssROUTER - Mechanical Cutting and Engraving Package with CAD/CAM/CUT. The ssROUTER application utilizes the ss4544M 4 axes motion control system, along with the HANDPAN control panel, and the TestraMW Windows CAD/CAM/CUT program. This package allows you or your customers to do your design in any Windows environment, CAM your design and send the job to the ss4544M to be run independently on the Handheld pendant. In addition you can import DXF files from other design programs, HPGL plot files, and G-code. HPGL and G-code files may be used directly, or may be imported in to the CAD drawing for modification and CAM work. The system has 32 megabytes of program storage memory, so there is plenty of room for multiple jobs. Jobs may be started immediately, before the entire job file has been sent. From the handheld control pendant you have complete control over the machine. You can Jog all axes, set work zeros referenced to upper left or lower left, or set and use two preset work zero positions. The system also has automatic controls for setting the work surface, and automatic tool length compensation. There are also built in automatic and manual controls for spindle, exhaust or dust collection, coolant, and vacuum hold down. A totally automatic tool change system may also be integrated by special request. With a rotary fixture on your machine, you can also do lathe work, and 3d engraving on cylindrical material. The TestraMW CAD/CAM/CUT system allows you to design in 2D with some 3D features. With the CAM system you can create output for cutting, pocketing, islanding, inside and outside contouring, on 3D surfaces. There are a set of centerline cut fonts and outline fonts built into the system, You may also use any Truetype font for your lettering. Signs are a snap. You can enter a list of text that you want to use. Drag it around your drawing to the position you want, resize, stretch, distort, warp, wrap, etc. to get the effect you want. You can even place text on surfaces of various geometric objects, such as the outside of a ball, or around a cone, etc. You can also import 3D g-Code files and run them directly on the system. You can import DXF files from other systems, and also export your designs in a DXF format for use on other system. ssCNC - This is a full four axes CNC control program that runs under Windows 95/98 or in DOS mode. All timing and control is actually done in the ss4544 system, so there are no problems running under windows even with other jobs running concurrently. Your computer talks to the ss4544 box on one of the standard serial communication ports. The program interprets standard g-code commands and will accept output from most CAM preparation programs. In addition toolpaths drawn in a program such as Autocad may be converted by the ssCNC's DXF to G-code converter. The software in conjunction with the ss4544 motor control system will provide high performance control to a wide variety of CNC machines. It provides three axes linear interpolation, and two axes circular interpolation. The continuous path feature with look ahead gives you fast smooth machining. Check out the specifications to see the many features available to help in quickly setting up you job and running, such as parameterized step and repeat, automatic setup file that saves all job parameters for the next time you run, on the fly feed adjustment, and much more. The ssCNC may also be run in graphics mode. This is useful when you are running one of a kind or first articles. When you chose to run your job graphically you get a graphics screen with a text display and control area on the right edge of the screen. The remaining left portion of the screen represents either your machines extents or work area, a zoomed view of the actual area used by the job, or a zoomed view of a portion of the job. A job may be previewed which will display the G01 toolpath. While actually running a job, the display will be first cleared, and the tool path drawn as the cutting is taking place. The jobs cutter position is shown in the display area, as well as the current elapsed time of the job. At the bottom of the screen there is a text status line which displays the next g-code block to be executed. A working version of this program is included within ssDEMO which may be downloaded. It may be run without a machine being connected so you can see a simulation of how it works. Within the ssDEMO program is complete documentation for setting up and using the ss4544 system. The ssDEMO program also includes programs to setup up a machine and tune it for optimum performance. These parameter settings are then saved in the ss4544 flash memory for turnkey operation of the ssCNC or ssLASER programs. 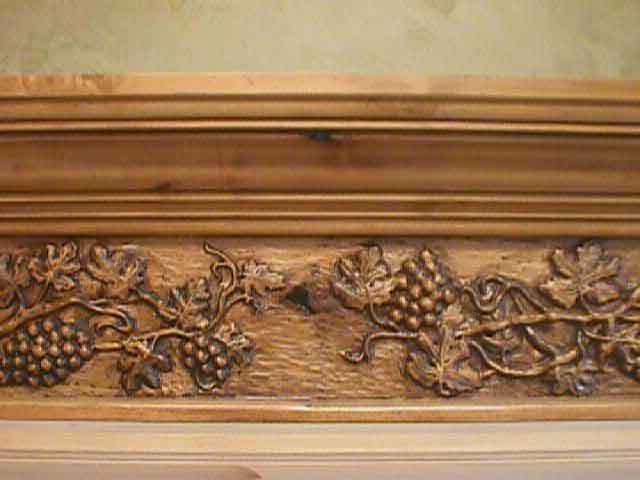 A couple of examples of 3d routing using ssCNC done by Carved Mantels. 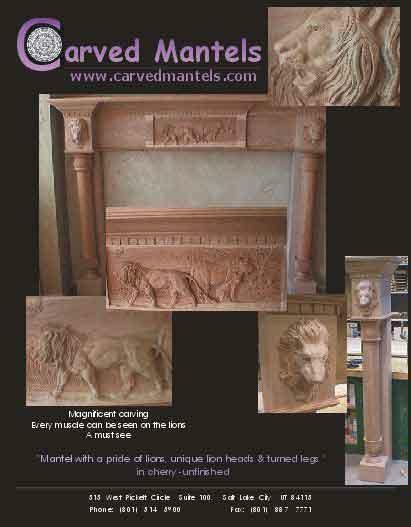 Click on the picture for a full view, or click on their logo to see more.